Yoga Styles: Which One is Right for You? If you’re new to yoga, or if you’ve just been taking yoga classes at the studio that’s closest to you, it may be a little intimidating to try to find another studio to visit. If words like “hatha” and “vinyasa” leave you feeling confused, this post is for you! Every studio will be a little different, but my aim here is to give you an overview of the major yoga styles that you’re likely to encounter. No one style of yoga is inherently better than another, it’s all about finding the right style for you. Hatha yoga is a slower, gentler style of yoga. In a hatha yoga class, poses tend to be held a little longer than in a flow-based class, and often (but definitely not always) the poses are less strenuous than poses practiced in other styles of yoga. In many hatha yoga classes, you’re encouraged to find a meditative state as you practice poses. Iyengar yoga is similar to hatha yoga in speed in most cases. In Iygengar yoga, a strong emphasis is placed on alignment, and many Iygengar classes use many props to help maintain alignment in poses. Poses are generally held longer in Iyengar yoga than in other yoga traditions. Flow yoga, or vinyasa yoga, focuses on moving between postures with your breath. In a more vigorous vinyasa class, you may hold a pose only for an inhale or exhale, but in some poses and some classes, you may hold a pose for several breaths. Vinyasa yoga includes many different subcategories of yoga, so it may be helpful to talk to a teacher or studio representative if you want to get a better idea of what a studio’s classes will be like. Learn more about yoga styles to find the right one for you! Technically, Ashtanga Yoga means any style of yoga that follows the eight limbs of yoga outlined in the Yoga Sutras. But, if you find a studio that teaches Ashtanga yoga, it almost always refers to a vigorous style of yoga that follows a set series of poses, based on the teachings of K. Pattabhi Jois. You move relatively quickly between poses, moving to your breath, as in other vinyasa yoga styles. Power yoga is a broad term, but primarily refers to a vigorous vinyasa class. You’ll move relatively quickly between poses, focusing on warming the body and preparing for more advanced poses. Some, but not all, power classes will be heated, so be sure to check with the studio you’re thinking about attending if you have a sensitivity to heat. In a Bikram yoga class, you practice the same 26 yoga poses in a room heated to 105°F. You’ll sweat a lot in a Bikram class, so be sure to drink plenty of water before and after class. There are some studios that practice a style of yoga that’s almost identical to Bikram yoga but have stepped away from the Bikram name due to the controversy surrounding Bikram Choudhury himself. Restorative yoga, also called yin yoga, is a very slow form of yoga. You may hold a pose for several minutes as your muscles and connective tissue relax and release. Like Iyengar classes, many restorative yoga classes will use props to allow you to relax more into the poses since you’re holding them for longer periods of time. If you’re wondering what style of yoga would work best for you, try this quiz from Greatist. 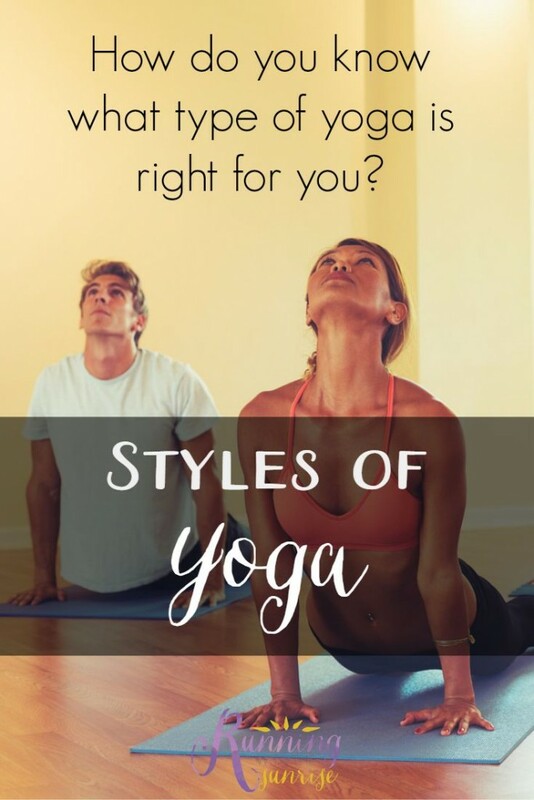 It helps guide you through what you’re looking for in a yoga class to help you decide which of the yoga styles would work best for you. Yogis: what yoga styles do you practice? This is a great reference. I’ve always been so confused about the different types. Now I know what to look for. I do like vinyasa and Ashtaga…I like the strength and athleticism that these practices bring to my mat. But I love hatha. My studio is based on Anusara, and the classes are fun! I don’t care for hot yoga, at all. Well this is really informative. I wish I had known some of the subtle differences before. I’ve been slacking on my yoga and need to get back there. I really like how clearly you outlined all of these! I find my yoga preference varies based on my training; when I’m not in the peak weeks of training, I do a lot of vinyasa and power yoga, but when I’m logging a lot of miles and doing hard workouts, I prefer restorative and hatha yoga. I tried hot yoga, but it was not my cup of tea – too strenuous on top of running for me. Love this! There are so many different styles of yoga, and there’s one out there for everyone! This is very informative! When people ask what kind of yoga I like I just say vinyasa because it was the only one I really understood. I’ve done yin yoga before and also really enjoy the different pace and focus of that! Actually Yin Yoga and Restorative Yoga are actually two different types of yoga. Here’s a great explanation of the two.